Videos you buy or rent from iTunes store are in the DRM-Protected .m4v format. That's to say, you can't use them freely. Then you may need a tool to remove the annoying DRM protection. 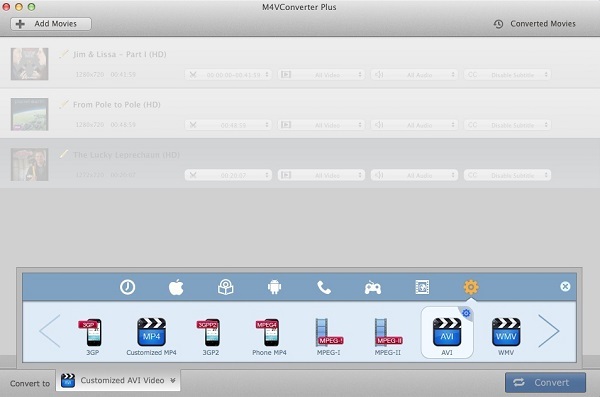 M4V Converter Plus is just a wonderful protected m4v converter. It can help you to convert iTunes protected M4V video files to other unprotected formats with excellent output quality and high speed. You can see that M4V is just apples incorrectly used extension for mp4. Now assume you can remove the DRM protection, and then you can convert protected M4V video format to unprotected mp4. 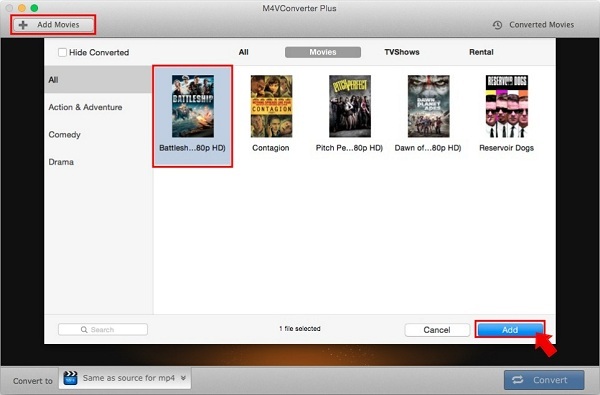 With M4V Converter Plus, you can remove the DRM protection from iTunes M4V files easily. What's more, it can convert almost all video formats that could be played on your iTunes, especially DRM-Protected M4V you purchased or iTunes movie rentals. Now get the new version of the protected M4V Converter and follow the detailed tutorial to convert protected M4V to any other plain format with high quality. Step 1: Open the program and add DRM protected M4V videos. Click "Add Movies" button to import the M4V files. Select the files and click "Add". In the profile, there are kinds of video formats and presets for you to choose, including MP4, AVI, FLV, 3GP, MP3, AAC and so on for iPod, iPad, iPhone, PSP, iRiver, Creative Zen, Android phones and other popular video player devices. Step 3: Start converting protected M4V files. Press "Convert" button or click the menu "Control-> Start Converting". Now you have done the process of converting DRM M4V files to unprotected M4V within minutes using the powerful Protected M4V Converter - M4V Converter Plus. You can also convert M4V video to MP4, convert protected M4V to DRM free MOV with satisfied output quality. Convert iTunes movies to unprotected video files - convert DRM-Protected M4V you purchased or iTunes movie rentals to unprotected MOV, M4V or MP4 for iPhone /iPod Touch, QuickTime and Apple TV. Convert iTunes video purchased - convert any video can be find on your iTunes to be playable on your PSP. Convert iTunes movie rentals - convert movie you rent from iTunes Store in short time then you can keep it and play it without time limitation. Extract audio from iTunes video - extract your favorite music from protected iTunes videos. Convert with high speed - offer amazing recorded speed. If you want to remove the DRM from iTunes movies, you can free download M4V Converter Plus and have a try to remove DRM protection from your purchased video or iTunes movie rentals.